This is one of the most popular and rented homes in the Venice area. This direct bayfront house lies along the northern shore line of Dona Bay, in a neighborhood of multi million dollar homes. The house rests on a very large and private lot. The views and atmosphere are spectacular being just 50 feet from the water's edge. Quality and value keep this home booked year round. There is no smoking permitted on the property, inside or outside. Pets are not accepted. With the large private lanai and heated pool (electric heat pump) as a centerpiece and the bay front providing big water views, the views are magnificent from every room in the home! The home has a private fishing/boat dock. The home is wonderfully decorated and is equipped with everything. This 1994 home features three bedrooms, 2.5 bathrooms, a formal and casual dining area, large family room (with a new hi def 52' flat panel LCD TV and DVD/DVR), formal living room, a large kitchen, laundry room and garage. All rooms are oversized, with the home boasting over 2700 sf under air. The king and queen bed are new, quality, 14" memory foam mattresses with luxury toppers and mattress pads, and fine linens and comforters. Enjoy boating, fishing or crabbing on your private dock. Boats and trailers may be accepted with additional fee for docking. Be sure to mention boat or trailer needs when inquiring. Provide boat size, make, outboard, or I/O, and depth needed. The boat lift IS NOT available for use without a significant deposit and/or fee. With the split plan and two living areas, the home is spacious and comfortable. The three bedrooms sleep six, but with special arrangements can accommodate up to eight. Please inquire for special arrangement information for more than six guests. Our guest reviews say it all. Please take the time to read our many five star reviews. Many beaches nearby. Venice and Nokomis beach 1.5 miles away and Siesta Beach about 20 minute drive. Enjoy boating, fishing or crabbing on your private dock. 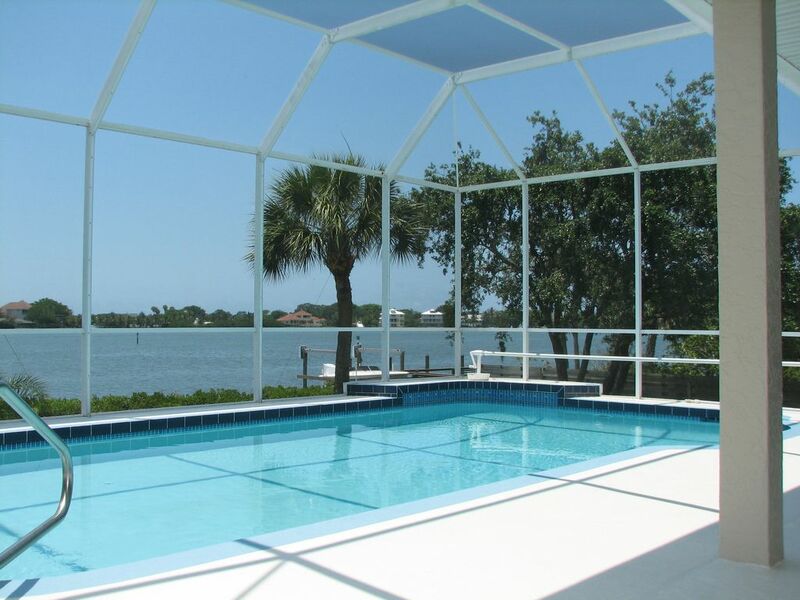 Being a waterfront home with a dock, and having a swimming pool accessable from most rooms through sliding glass doors (without alarms or fencing around the pool), this may not be the best choice for children that are not able to swim. Online booking and payment confirms and acknowledges the guests have read and agree to all the term and conditions in this ad description and the rental agreement. If you cannot find this on the website, please contact the owner for a copy to be emailed or faxed to you. I love the Venice / Sarasota area and all that it has to offer. We reside next door so you will always rest assured your vacation home will be in top notch condition. I take great pride in offering the finest vacation home in the area. Location, amazing bayfront views, private pool and boat dock, privacy from neighbors, large house with fantastic floor plan, large rooms, quality furniture, decor, and bedding. Bayfront with private boat / fishing dock. Amazing waterfront views. toilet, outdoor shower, Off pool and master bedroom. Great addition to master suite. Direct bayfront on Dona Bay, with private boat/fishing dock. Spectacular views from most rooms in the house and pool area. Beaches just 1 - 1.5 miles away. Walk, bike, or drive. Direct bayfront on Dona Bay, with private boat/fishing dock. Spectacular views from most rooms in the house and pool area. Family room and living room for comfort and privacy. There is a formal dining room seating up to six, an eat in kitchen dinette seating four, and the outside (most popular) dining by the pool seating eight. 52" high def flat screen in family room. 27" tv's in master and second bedroom. Premium cable package with hundreds of stations and music. Your own private boat/fishing dock with boat rentals nearby. Nearby public and private clubs. Hard courts and clay. Heated luxury bayfront swimming pool with large deck, lounge chairs, and dining table for eight. Great views and loved the layout of the house. Enjoyed the pool, seeing dolphins and all the wonderful birds. Bryan was terrific and assisted us promptly when there were any issues. Looking forward to returning to the Nokomis area in 2020. Absolutely fabulous. Best vacation house we have stayed at. Our vacation was our best ever. The home was extremely spacious and had absolutely everything we needed. I mean everything. There wasn’t anything I wished I had cause if I didn’t bring it, it was there. Bryan said he would have the pool warm for us and it was. My family used it morning, day and night everyday even in the low 50 degree weather. The dock was amazing for my family. They are all big on fishing and the dock was wonderful. They scheduled two fishing charter trips and while those were fun neither one of them compared to the dock fishing. They caught many fish and all different kinds. The house is located very close to great restaurants, shopping, beaches and bait shop. Pretty much everything was a short distance away. And Siesta Key Beach (softest white beach ever) was just a short drive away. There were labels on everything and explanations for everything. The view is amazing at all times of the day and pretty much from anywhere you stand in the home. I could really go on and on about how much we LOVED this home. Thank you Bryan for sharing your amazing home and we can’t wait to come back!! Wow, Best review ever! I am so glad you had a great time. I am very aware we offer something unique in a vacation experience. The views are amazing. The pool and privacy are fantastic. I take great pride in maintaining the home. I have had so many five star reviews over the years, I don't usually chime in. But kudos to such good writing on this well thought out review. This was a typical experience in our vacation house, but this was the best review ever! This is a beautiful home with a view from most of the rooms that would be very hard to beat. The home is spacious and well kept. There are ample kitchen furnishings for cooking & entertaining. It is on a quiet street and is very private. Even in November the salt water pool temperature was pleasant. The owner is very responsive. We had a wonderful time and will definitely try to book this home again! Very clean and spacious. Eveything is well thought out. Due to the red tide incident í was only able to go to the beach once but the pool was great and lots of barbecue cant imagine how much fun it would be with the beach. Great Place!! cant wait to come back!! Located about 1.5 miles from both Venice Beach and Nokomis Beach. Only 10 miles to Sarasota and 60 miles to Tampa and 120 miles to Orlando. Make a side trip to Busch Gardens, Tampa and of course, Disney in Orlando. Or just relax at our fine beaches, play golf and tennis year round, many fine restaurants and local activities. Please check availability calendar. Holidays may be peak season rate. If desiring to bring a pet, please give breed, and weight of animal(s). We do not accept all pets and reserve the right to refuse reservation at our discretion based on pet's breed and size. Pet fee is charged for each pet if more than one is accepted. Between June 03 and August 26, weekly rentals of Saturday to Saturday are accepted. Other stay options may be considered. Less than weekly stays may be available upon request. Just ask. Current years guests have first option to return the next year. Therefore, we do not accept reservations more than eleven months in advance. If bringing a boat, there will be additional docking fees. The boat lift IS NOT available for use (unless large deposit and/or fee is paid).